Despite a freeze in high-level contacts between Israel and the Palestinian Authority, the head of the country’s left-wing Meretz party met PA head Mahmoud Abbas Sunday. Meretz chairwoman Zehava Gal-On traveled to Ramallah to discuss ways to advance the peace process and to discuss a controversial letter Foreign Minister Avigdor Liberman wrote to world leaders calling for Abbas’s ouster. Jerusalem slammed Abbas for agreeing to meet Gal-On, a prominent member of the opposition, saying that peace can only be advanced if the Palestinians engaged with Israel’s elected government. Gal-On was scheduled to meet with Abbas at 1 p.m. and hold a press conference after the meeting, which was initiated by former Israeli ambassador Ilan Baruch. Now Gal-On’s policy adviser, Baruch famously quit the foreign service last year because he said he felt he could no longer represent the policies advanced by the government of Prime Minister Benjamin Netanyahu and Liberman. 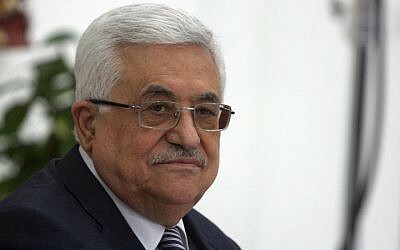 In her discussion with Abbas, Gal-On intended to bring up the controversial letter Liberman last Monday wrote to European Union foreign policy chief Catherine Ashton, US Secretary of State Hillary Clinton, Russian Foreign Minister Sergey Lavrov and UN Secretary-General Ban Ki-moon, in which he attacked the Palestinian leadership and called for new elections in the Palestinian territories. She also planned to talk about ways to advance the stalled peace process, Gal-On told The Times of Israel before the meeting. Since peace talks broke down several months ago, the peace process has been stalled, with Abbas refusing to meet Netanyahu or other senior government officials. In June, deputy Prime Minister Shaul Mofaz — who has since bolted the government and returned to the opposition — said he had scheduled a meeting with Abbas, but the Palestinian president canceled and the two never met.